View Poll Results: Which has better natural scenery? The definition of natural scenery can be extended to anything from parks to beaches to the waterfront to the terrain itself. Pics are welcome in this thread. That's a tricky one. On thing SF has over Oakland is the ocean, but Oakland has plenty of undeveloped hills unlike SF. There isn't much undeveloped land. Stern Grove, Angel Island, Golden Gate Park. That's probably it. I vote SF, I've always had a soft spot for coastlines. Driving down Mandana Blvd through Crocker Highlands as you near Trestle Glen is quietly one of my favorite streets in all of Oakland. Tree-lined streets as a view of downtown Oakland peeks through... for me, it's just a 'wow' moment. San Francisco has those moments, too. Seaside cliffs, etc, but Oakland is less developed. There is far more real estate in Oakland that features tree-lined streets, lawns, etc, than in SF. And the Oakland Hills? Gorgeous. Lake Merritt? Can we call that natural? I'd say so. Gorgeous. Either city is gorgeous, but I think Oakland has more practical natural beauty. Oakland, because when you go to the Oakland hills, there are a lot of trees and trails. San Francisco, does not have that. Golden Gate Park? The Presidio? I'm an ocean person so I'll go with SF although this was a tough one. Oakland has some pretty stellar views from the hills. SF really has one of the most stellar and famous skylines in the world. Oakland not so much. SF has a lot of parks and while they can be kind of threadbare they are all pretty accessible. Lake Merritt in Oakland is nice and all and SF is really missing something like it, but Oakland doesn't have the wide spread of parks that SF has--I really wish there was something like Dolores Park in Rockridge. The Oakland Hills and that Redwood Thingy Park are way too high up in the hills for me to get to unless I bum a car ride from a friend, at least in SF I can go to any park I want without a car other than Twin Peaks which you can get to by a bus that doesn't run very often. I do like the local ecology in Oakland better though--lots of big oak trees, and during spring you see a ton of stuff blooming that you rarely see on the sidewalk in SF--dogwood trees, daffodills, irises, calla lilies, etc. Oakland almost feels like a lush East Coast city because of this. SF feels very sparse in terms of horticulture and only has a few kinds of trees that you commonly see on the sidewalk. I'd say they're maybe tied, they feel very different in terms of natural beauty. SF has the skyline and accessible parks. Oakland has Lake Merritt, the hills and nicer horticulture. In SF, I love Baker Beach & the Presidio - pretty trees and breathtaking ocean/bridge views can't be beat, but the Redwood parks in Oakland make you feel like you're a world away from urbanity, rather than the couple of miles it actually is - standing at the top of a hill in Sibley, you can see all the way from the Golden Gate to the windmills of Rio Vista. Depending on which trail you strike out on, you could end up either in lush greenery or rolling hills. I think the nature in SF is more dramatic, but in Oakland it's more encompassing - more of Oakland's landscape is comprised of forested areas. It's hard to decide. The problem with San Francisco and its natural scenery that it is too small. Oakland on the other hand, the natural scenery there is very large and the trails and where the big trees are can be miles and miles long. Well, San Francisco does have Lake Merced. 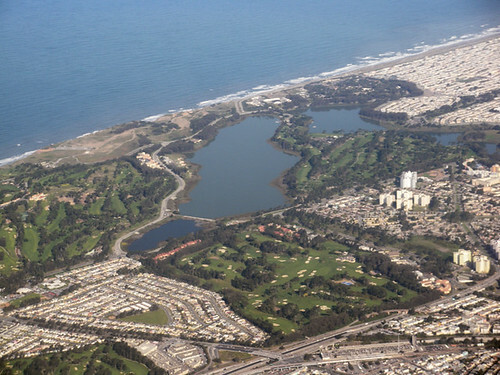 But Oakland also has Lake Temescal and a bunch of creek systems that simply are not present in SF. The contrast between Sausal Creek and the concrete jungle its wedged between (Fruitvale Ave) is stunning... I'll try to take a picture of it today.